Knotts Cottage Self-cateringKnotts Cottage is a grade 2 listed character cottage, and is part of an 18th Century farmstead sitting in an elevated position overlooking the Troutbeck Valley and taking in the whole vista of Lake Windermere, and the fells in the distance. The cottage is mid-way between Windermere and Ambleside on the main road up to Kirkstone Pass and well placed for touring throughout the Lake District. This character cottage provides a high quality contemporary finish mixed with beautiful character features. The approach to the cottage will treat you to magnificent westerly views over Lake Windermere, the Coniston hills and Langdale Pikes beyond - surely one of the finest panoramas in the National Park. There are walks from the door to Troutbeck and a good Tapas bar ten minutes downhill on foot. Accommodation: From the parking area in front of the cottage it is necessary to walk through a gateway and a few yards along the roadside to reach a second gateway which leads to the entrance door. This leads straight into the character living/dining room (32 inch wall mounted TV with freeview and free Amazon Prime instant video, free wi-fi, ipod dock and log burning stove). Door through to small but perferctly formed and well equipped contemporary kitchen with shaker units and meteoris granite worktop. Narrow stairs rise quite steeply from the sitting room to a small landing where there are two bedrooms - a king size with views up the valley towards Wansfell and a twin with views towards Lake Windermere and Claife Heights. Fully fitted modern bathroom with mood lighting, p-shaped bath with power shower over, basin and wc. Lovingly restored and refurbished Knotts Cottage oozes character and great attention to detail has been given to the finishing touches to the decor and soft furnishings in this pretty cottage. Mostly fitted carpets with a feature flagged floor with rug in the sitting room. 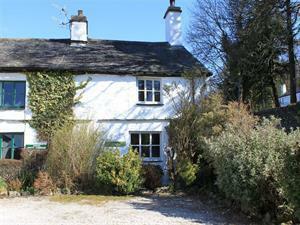 Plenty of beams add to the character feel and gas central heating keeps the cottage cosy for all seasons. Outside: A couple of steps lead from the house up to the garden with patio area with garden furniture at the end with panoramic views of Lake Windermere and the fells beyond - a lovely spot just to watch the boats go by on the Lake and take in the afternoon sunshine! Laundry facilities in outside store. Seperate outside store for for up to 2 adults and 2 childs bikes. Private parking for two cars. Local store and public phone in village, railway station and Booths supermarket 1 mile approx. Note: You need to walk a short distance along the main road to get to the entrance, children must be supervised. One small, well-behaved dog welcome * non-smoking * duvets/beds made up for arrival * younger children will need to be supervised on the roadside * ceramic electric hob and electric fan oven * fridge * freezer * dishwasher * microwave * auto washer and dryer in outside store * all fuel included * logs for fire available locally * free wi-fi * gas central heating and hot water * travel cot and high chair available - please order * towels available - please order * local store and public phone in village; Booths supermarket 1 mile approx. Knotts Cottage offers weekly bookings starting on Saturday.